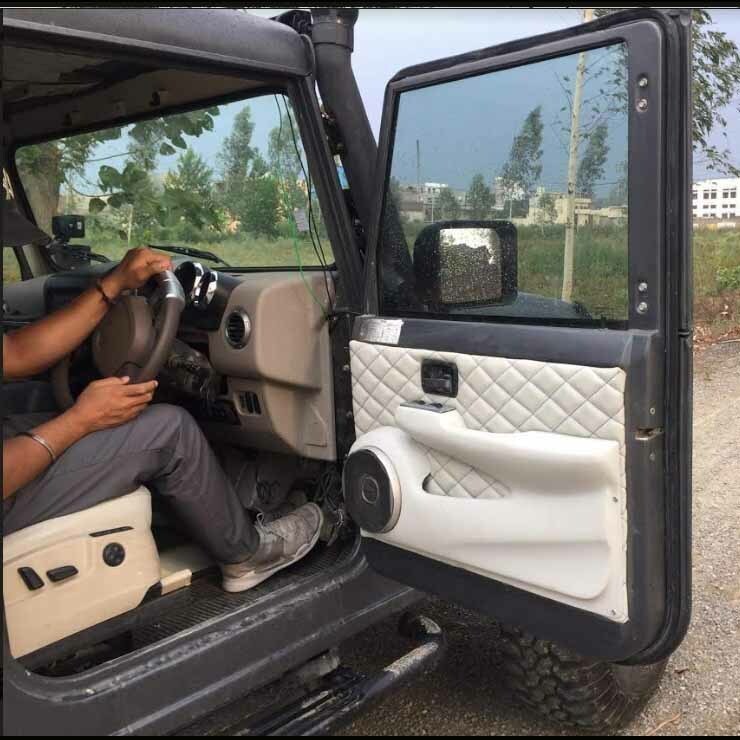 The Mahindra Thar is a lifestyle SUV that enjoys a huge fan following. It’s also a hot favourite among customizers and off-roaders. The bold stance and simple construction make it really easy for customizers to work their magic on this SUV. It’s really interesting to note how a handful of minor changes can give this SUV a totally clean look. Today, we have a really angry-looking Thar that has been done up by one Sarbjit Singh. 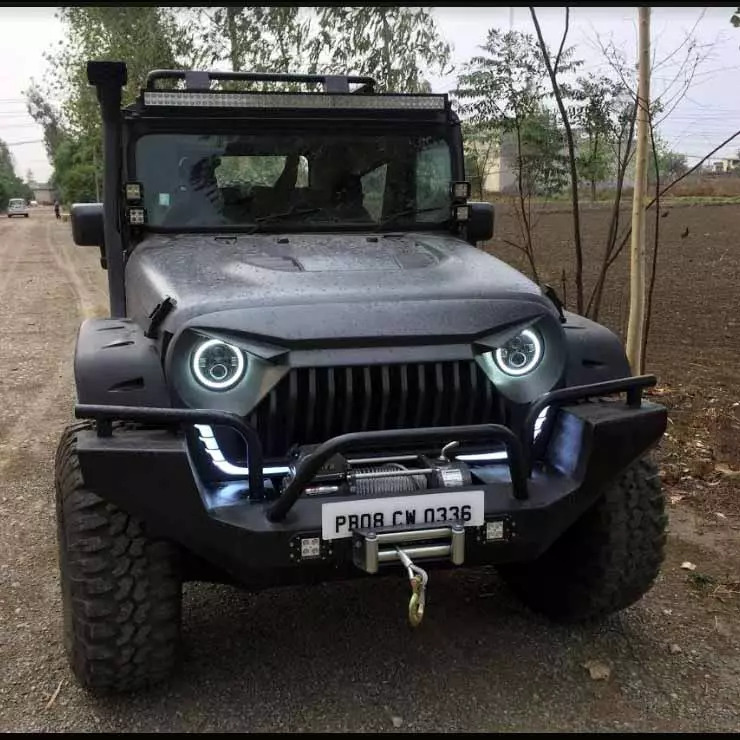 The front-end of this modified Mahindra Thar carries a really mean look, which is courtesy of a custom grille that has a bold crease flanking the two custom head lamps. These headlamps carry projector units along with a LED DRL running along the circumference. Other than this, the front-end also gets a metal bumper with an electric winch. There’s also a custom hood, a snorkel, a set of spotlights and a roof-mounted LED bar. The side profile is characterized by custom doorsteps, a set of bigger ORVMs and custom fender cladding. The original wheels have been replaced with bigger rims shod with some fat rubber. Also, this Thar has a custom-made hard-top. 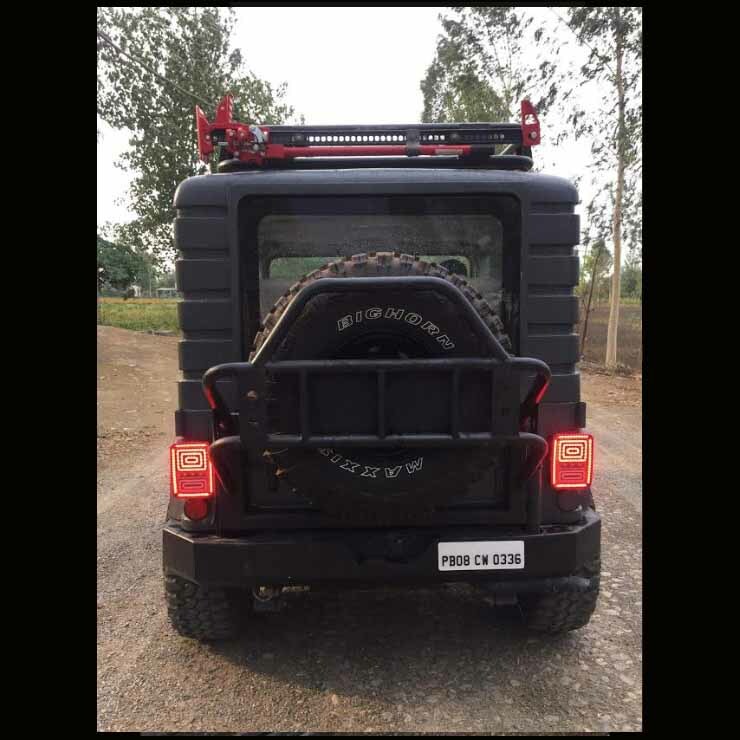 At the rear, there’s a set of new LED tail lamps, a metal bumper and, of course, the huge spare wheel. Full details about the interior aren’t available at the moment. However, the door pads have received a custom leather upholstery. The rest of the cabin also gets a beige colour theme. Another highlight is the electric adjustment for the driver’s side seat. It’s also not known if this modified Mahindra Thar SUV carries any performance upgrades. The stock vehicle is equipped with a 2.5-litre, four-cylinder, turbocharged diesel engine that produces a maximum power of 105 bhp along with a peak torque of 247 Nm. The motor comes mated to a five-speed manual transmission that can send power to all the four wheels through the 4×4 hardware. The several mods this Mahindra Thar carries gives it a totally distinct appearance. Like we said, the new front grille plays a major role in making this vehicle look really bold and aggressive.